It is well known that some of the most common New Years resolutions are to eat healthier, lose weight, get in shape, etc. 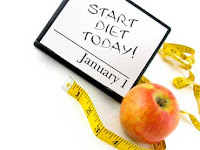 So, since by now about half of those that set New year's Resolutions have broken them, I figured I would interview some of my closest friends and co-workers and ask them what the smartest diet and exercise tips they had to offer. These tips come from people that have fought the weight loss battle and won so take them and apply them to your daily life. They just may help you stick with that New Year's resolution after all...or at least stick with it longer than you expected! Since I got so many responses, there will be a part 2 & a part 3 to this post! 1. Save money and buy in bulk BUT separate out portion sizes into small, snack size sandwich bags. This not only saves money, it is also helping you eat healthier by minimizing how much you eat. If you eat out of the large containers, you will liable to eat much more than just one or even two servings. The snacks that often come in those 100 calorie packs also tend to be not so healthy choices. Instead of eating 100 calories of mini Oreos, crackers, etc, separate out bags of almonds, dried fruit, whole wheat crackers, etc. 2. If you are not feeling like working out, try and remind yourself of the feeling you get when you are done. More often than not, you feel 100 times better and more refreshed than if you had opted to forgo your workout. 3. Retrain your appetite. Instead of eating when you are bored and when you are not really hungry, wait about 10 minutes before you decide to dive into a meal. It is common for people to eat just because it is lunch time or eat out of boredom. Go for a walk, make phone calls, answer emails and, if you are still hungry, then eat. 4. Try to plan your meals at least a day or two in advance, if not a week in advance. It sounds difficult but it's really not. Make several chicken breasts on Sunday night and separate them out. Then make some whole grain rice and maybe grill some veggies. Many foods will keep in your refrigerator for at least a week and you can eat these foods as a lunch or dinner. Make a chicken sandwich on Monday, Chicken Parmesan for dinner Tuesday, fajitas on Wednesday, etc. It'll help you avoid poor food choices when you don't have anything ready to eat at hand. 5. If you are on a diet, focused on your New Years resolution or recently started a strict exercise regimen and you slip, do not give up!! Move on and work twice as hard the next day to make up for it. We all slip sometimes..
6. If you joined a gym, signed up for classes or got yourself a personal trainer recently, try and pay for the memberships or fees up front and in advance. Knowing that you have already forked over all of that cash will give you the incentive to keep going and not miss. 7. Put a mirror on your fridge! When you are about to reach in there for some impulsive eating (boy am I all too familiar with that! ), look yourself in the eye and make sure you are really hungry and really want to do that. Believe it or not, it is helpful and helps you confront what's really driving you to food. 9. Bet on it. A lot of people at work and at places of employment of friends of mine have started a Biggest Loser contest in the new year. They put $50 each into a pot on the first day. Then they diet and exercise for the next 30 - 90 days. At the end, the winner gets all of the money. If even just 10 people join, that's $500 you win! 10. Eat slow. Eating slow can help you feel full much faster, helping you eat less at each meal. It takes about 20 minutes to reach the point where your body will tell you your full so give yourself time to get there before it is too late and you stuff yourself silly!